The history of candy canes is rooted in both fact and myth, but there's no doubt these minty treats have quite a story. When European families first brought Christmas trees into their homes, their decorations were simple: candles, dried berries and flowers, and sweet treats nestled among the branches. A white, straight stick of sugar candy was one of the sweet treats. Although a seemingly simple candy, making it was laborious for a confectioner. Melted sugar had to be handspun, then pulled to great lengths, rolled tightly, and cut. 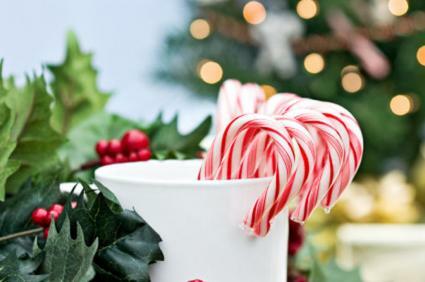 The first candy canes didn't have the distinctive red stripes or peppermint flavor. But, the candy cane was a still a long-lasting, tasty delight to enjoy on Christmas morning. How does a simple stick of sugar candy come to embody holy symbolism? A little bit at a time. In the mid-1700s, a German choirmaster at the Cologne Cathedral bent the straight candy at the tip, creating a little hook, so the candy resembled a shepherd's crook. He gave the candies to the children attending the Christmas pageants to encourage good behavior. Confectioners liked the change, and many made the candies in a hook shape every Christmas. Then, people decorated their trees with candy canes hanging from the branches instead of just resting on them like before. In later years, it was said the shepherd's crook shape was also the letter "J" for Jesus, and together, the candy symbolized Christ looking out for His flock. It's unclear when in the history of candy canes the red stripes appeared, or exactly why, but it might have something to do with the popularity of stick candy, also known as barber pole candy, in the early 20th century. Confectioners expanded on the simple candy stick by swirling in flavors such as sassafras, horehound, licorice, butterscotch, and mint. Colored stripes helped the eager customer distinguish one flavor from another. Adding a festive red stripe flavored with mint to the hooked candy probably capitalized on the popularity of the other candy sticks. Some say thick red stripes were added to symbolize the blood of Jesus on the cross, or perhaps as a reference of God's love. The three thin red stripes are believed to represent the Father, Son, and Holy Ghost. The white color remained as a reminder of Mother Mary's virginity and Christ's purity. In 1920, Lt. Bob McCormack of Georgia wanted to give candy canes to family and friends, but worried about keeping them fresh. He developed a cellophane wrapper that kept the candy free of moisture. He started a company, Bobs Candies, to mass-produce candy canes. In the 1950s, his brother-in-law Gregory Keller invented a machine that automated candy cane making. The iconic red and white candy cane is still a holiday tradition, but candy canes have entered the 21st century. Colors and flavors range from pink and orange tutti fruitti to electric blue blueberry. You'll find pastel-colored canes to use for Easter, and even organic candy canes. Sizes and shapes have changed, too. Tiny candy canes decorate mini Christmas presents, while mongo canes three-feet-long weigh down holiday stockings. Some candy canes even come in the shape of crosses. The next time you lick a candy cane, remember that it's come a long way from a simple piece of sugar candy.